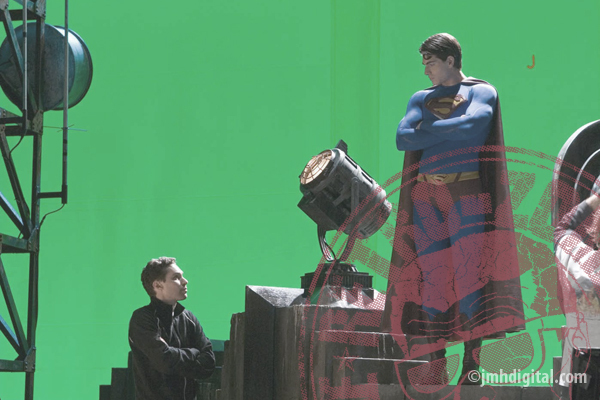 Actor BRANDON ROUTH who stars as Superman (right) and director BRYAN SINGER. Plot: Superman (Brandon Routh) has been missing for five years, since traveling to the location where astronomers believed they had discovered the remains of Krypton. During his absence, Superman's nemesis, mad scientist Lex Luthor (Kevin Spacey) was released from prison (due to Superman's failure to appear at Lex's trial) and married a rich widow (Noel Neill) to obtain her fortune upon her death. Superman, having failed in his quest to find surviving Kryptonians, returns to Earth and, as Clark Kent, resumes his job at the Daily Planet in Metropolis. He subsequently learns that Lois Lane (Kate Bosworth) has won the Pulitzer Prize for her article "Why the World Doesn't Need Superman." Meanwhile, Lex travels to the Fortress of Solitude and steals Kryptonian crystals, to use for an experiment that causes a mass power outage on the East Coast. The power loss interferes with the flight test of a space shuttle to be launched into space from its piggy-back mounting on an airliner, occupied by Lois Lane, who is covering the story. Clark flies into action as Superman and stops the plane from crashing onto a baseball stadium. Many of you agree that some men shouldn't fly, I say this was not that terrible as many have stated... sadly I believe that Routh was the guy to have pulled this off. His career would never be the same, he should have been much more famous, not famous for being in this film. Superman Returns just lacked... spirit? Heart? Not sure. Had some cool effects though. Routh was great in a confusing movie. 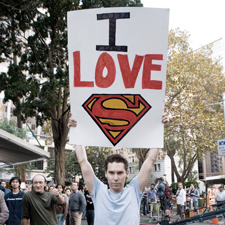 He's played different roles that reference his new status as Superman like "Scott Pilgrim vs. the World." Great green screen pic. I didn't hate Superman Returns.....but it really didn't hit home for me. From everything that I've seen of Man of Steel, I think that this one may hit the mark.....and I would love to see a new series of GOOD Superman films!